The following pieces have been generously donated to the MBC by these community members. I came to Canada from South Africa in 1975 and Mahone Bay has been my home since 1980. 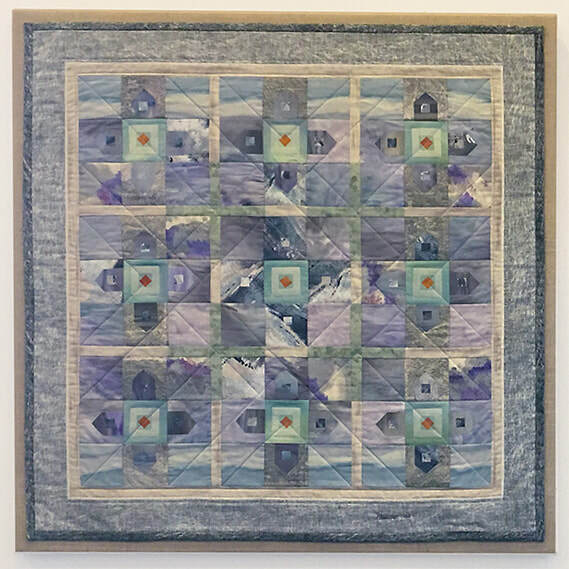 I was a founder of the Mahone Bay Quilter’s Guild. 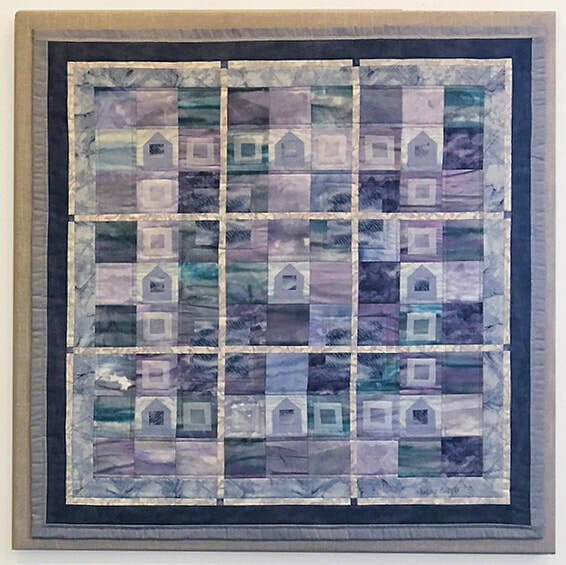 I wrote two books on textile landscapes and my quilting career took me to Japan, Germany, the United Kingdom, South Africa and all over the United States to teach. My work is held in both private and corporate collections in Canada and the USA. I am delighted to have my work hanging in the Mahone Bay Centre, the heart of my community. Mahone Bay is a strong artistic community, and very supportive of the arts. "Every piece of wood tells a story." Amos Wood, a locally owned, family business, is well known for its focus on quality craftsmanship. Trestle tables such as this 10' x 3' solid pine trestle table are historically associated with hospitality. 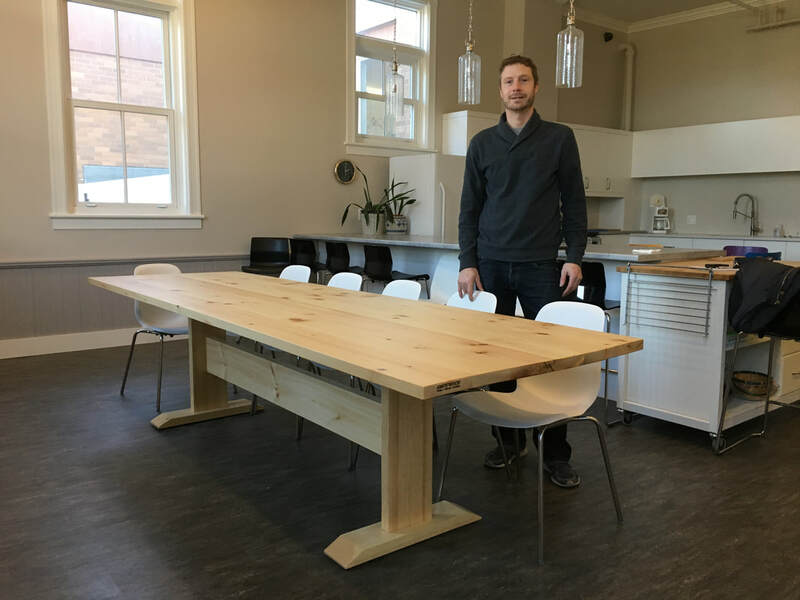 Presented by Logan Amos, this welcoming communal table sits proudly in the MBC kitchen. I was born in Halifax, raised in Ontario, and moved back to Nova Scotia like a homing pigeon at age 21, armed with a fresh BA degree. 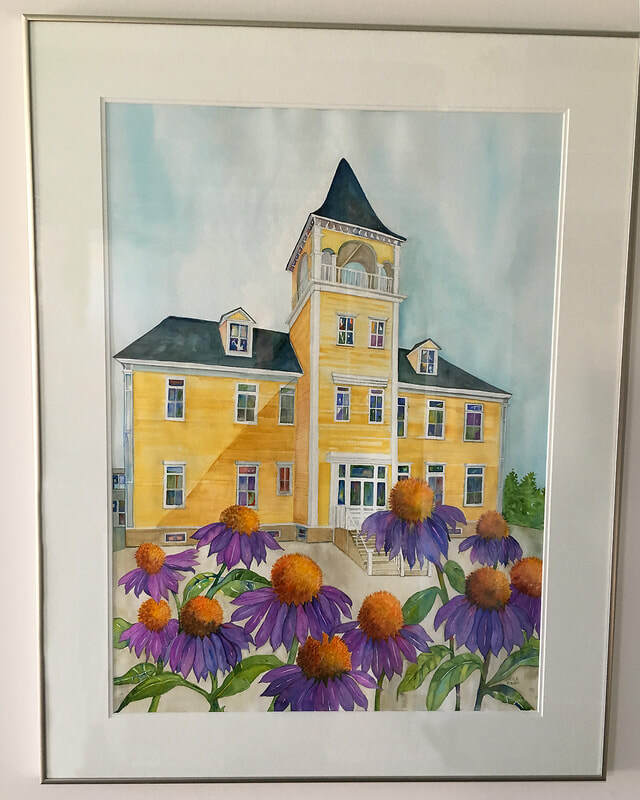 Having chosen education over art for my career, I completed a BEd at Dal, an MA at St. Mary’s, and spent many happy years as an elementary and junior high teacher, and a stint in administration in Dartmouth and Halifax County. During this time I studied art intermittently, and on retiring, began to paint full time, mostly in watercolour, occasionally in acrylic and mixed media. In 2006 I moved with my husband, Lyon Brumm, to Lunenburg County where I am proud to trace my roots back to the 1750’s. The Mahone Bay Centre has been an important part of my enjoyment of living here. From the beginning, when I rented a shared studio space, and throughout my eight years in my Room 407 studio, I have enjoyed so many of the activities on offer and have been in awe of the countless number of volunteers who work tirelessly to make this wonderful old building hum. It really is at the ‘heart of the community’ as the motto says. In 2017, when I chose to do a series called ‘My Little Town’, I knew “The Centre would be my first composition. 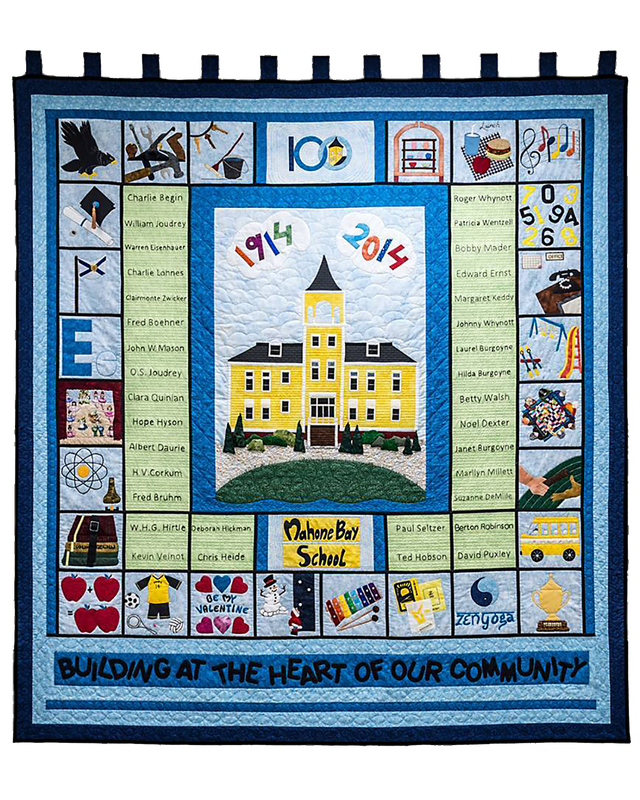 The beautiful 100th anniversary quilt made by the "piecemakers by the sea" ​Mahone Bay Quilting Guild - depicting a hundred years of community, learning and fun and commemorating pivotal people in the making of local history. Are you an artist interested in donating a piece of your work to the MBC?